The company says it will guarantee a read radius of 600 feet for a single STAR reader, which (using the “pi R squared formula) delivers a total read range of approximately 250,000 square feet. A company named Mojix announced today a radically different approach to RFID tag reading that, if it can deliver as promised, has the chance to cause dramatic shifts in the RFID market, and potentially spur RFID deployment in distribution. Fast forward more than a decade later, and Sadr’s company has expanded on that knowledge to bring to market a new system that changes the paradigm of passive RFID technology. To date, so called “passive” tags readers, such as those following the EPC standards, have combined the “exciter,” which energizes the tags so they can communicate data with the reader, which accepts and processes an activated tag’s signal. As shown in the figure below, the Mojix technology separates those tasks, deploying a network of stand alone exciters that work in conjunction with just a few readers (or even just one reader) that, according to the company, have read ranges dramatically higher than readers available to date – a capability derived from the space communications technology that was capable of picking up very faint wireless signals. The company says it will guarantee a read radius of 600 feet for a single STAR reader, which (using the “pi R squared formula) delivers a total read range of approximately 250,000 square feet. That’s as much as 100 times the read range of standard passive RFID readers. Kevin Duffy, Vice President of Sales and Marketing at Mojix, told Supply Chain Digest last week that the technology “brings the capabilities and benefits of active tag technology with the economics of passive technology.” Active RFID tags have their own power source within the tag, delivering much longer read ranges than passive tags. However, that battery also makes them much more expensive and, as a result, active tags are not considered viable for mass deployments, such as tagging cartons in a distribution center, because of the high cost. With the Mojix technology, a company would be able to track the “presence” of tagged items or assets with passive technology in a manner that previously would have required an active tag system. The Mojix system is also capable of detecting movement, such as a tag on a pallet moving from a staging location to a dock door, though Duffy said they are not ready to yet make statements on the granularity of movement sensing, which could be huge for applications such as order picking. Mojix says the total network offers a lot of flexibility and control. For example, exciters in an area could be configured to run in constant mode, always energizing any tags in a given area. But the exciters can be run in any number of different ways. In a dock door environment, for example, a control program would allow managers to select specific exciters at individual dock doors to turn on based on receiving or shipping activity. The instructions to individual exciters about turning on and off are actually wirelessly communicated via the STAR readers. For now, the Mojix network will support standard EPC Gen 2 tags from any source (Mojix is not a tag manufacturer). Future support of other tag types is likely, Duffy said. 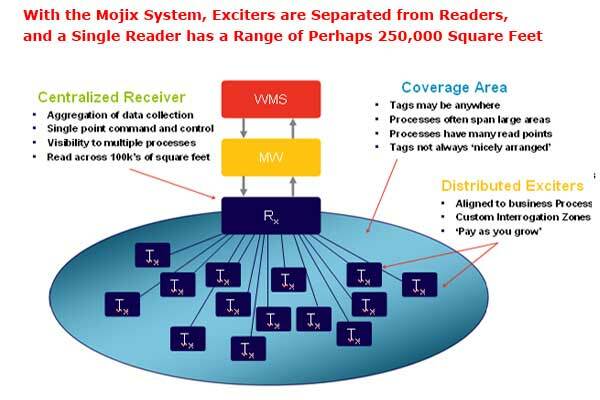 Duffy says that a Mojix STAR network can be deployed at a cost about 25% lower than a traditional passive reader network with total comparable coverage. The system is available for deployment now. The company says there is a full-scale, working system in Europe in a consumer goods company distribution center supporting the Metro Stores RFID tagging requirements. This week, RFID software application provider Xterprise will be named as a key Mojix implementation partner. The company plans to sell primarily through channel partners. What is your take on this new approach to RFID networks? Does it have the potential to really change the market and spur adoption? Let us know your thoughts at the Feedback button below.